Tapestri Bayeux atau Bordiran Bayeux (English /baɪˈjɜːr/ atau US /bɑːˈjuː/, /beɪˈjuː/; bahasa Prancis: Tapisserie de Bayeux, IPA: [tapisʁi də bajø], atau La telle du conquest; bahasa Latin: Tapete Baiocense) adalah sebuah kain bordiran dengan panjang sekitar 70 meter (230 ft) dan lebar 50 sentimeter (20 in), yang menggambarkan peristiwa-peristiwa yang berujung pada Penaklukan Inggris oleh Norman yang menyoroti William, Adipati Normandy, dan Harold, Earl of Wessex, kemudian Raja Inggris, dan memuncak dalam Pertempuran Hastings. Tapestri tersebut terdiri dari sekitar lima puluh adegan dengan tituli Latin, yang dibordir pada linen dengan kain wol berwarna. Diyakini, karya tersebut dibuat oleh Uskup Odo, saudara seayah William, dan dibuat di Inggris—bukan Bayeux—pada 1070an. Pada 1729, gantungan tersebut ditemukan lagi oleh para sarjana pada saat penyimpanan tahunan di Katedral Bayeux. Tapestri tersebut sekarang dipamerkan di Musée de la Tapisserie de Bayeux, Bayeux, Normandy, Prancis (49°16′28″N 0°42′01″W﻿ / ﻿49.2744°N 0.7003°W﻿ / 49.2744; -0.7003). ^ Caviness, Madeline H. (2001). Reframing Medieval Art: Difference, Margins, Boundaries. Medford, MA: Tufts University – via http://dca.lib.tufts.edu/caviness/. Yet in modern times, this piece of eleventh-century women's work has been wrongly called a "tapestry," a term that is readily associated with the large male-dominated workshops of northern Europe in the late middle ages that produced images woven into the fabric. The correct term "Bayeux Embroidery" evokes the manual work of women, probably the very reason that previous attempts to call this famous work a Broderie have not prevailed. ^ Koslin, Desirée (1990). "Turning Time in the Bayeux Embroidery". Textile & Text. 13: 28–9. ^ Bertrand, Simone (1966). La tapisserie de Bayeux. La Pierre-qui-Vire: Zodiaque. hlm. 23. et combien pauvre alors ce nom de broderie nous apparaît-il! Henderson, George. Early Medieval, 1972, rev. 1977, Penguin. Brown, Shirley Ann (1988). 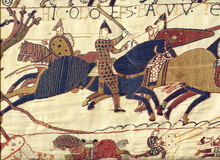 The Bayeux Tapestry: History and Bibliography. Woodbridge: Boydell. ISBN 978-0-85115-509-8. Burt, Richard, "Loose Threads: Weaving Around Women in the Bayeux Tapestry and Cinema", in Medieval Film, ed. Anke Bernau and Bettina Bildhauer (Manchester: Manchester UP, 2007). Foys, Martin K., Overbey, Karen Eileen Overbey and Terkla, Dan (eds.) The Bayeux Tapestry: New Interpretations, Boydell and Brewer, 2009, ISBN (paperback): 978-1783271245. Hicks, Carola (2006). The Bayeux Tapestry: The Life Story of a Masterpiece. London: Chatto & Windus. ISBN 978-0-7011-7463-7. Pastan, Elizabeth Carson, and Stephen White, with Kate Gilbert. The Bayeux Tapestry and its Contexts: A Reassessment. Boydell Press, 2014, ISBN 978-1-84383-941-5. Werckmeister, Otto Karl. "The Political Ideology of the Bayeux Tapestry." Studi Medievali, 3rd Series 17, no. 2 (1976): 535–595. Wilson, David McKenzie (ed.). The Bayeux Tapestry: the Complete Tapestry in Color, Rev. ed. New York: Thames & Hudson, 2004. ISBN 978-0-500-25122-5. ISBN 0-394-54793-4 (1985 ed.). LC NK3049. Wissolik, Richard David. "Duke William's Messengers: An Insoluble, Reverse-Order Scene of the Bayeux Tapestry." Medium Ævum. L (1982), 102–107. Wissolik, Richard David. "The Monk Eadmer as Historian of the Norman Succession: Korner and Freeman Examined." American Benedictine Review. (March 1979), 32-42. Wissolik, Richard David. "The Saxon Statement: Code in the Bayeux Tapestry." Annuale Mediævale. 19 (September 1979), 69–97. Wissolik, Richard David. The Bayeux Tapestry. A Critical Annotated Bibliography with Cross References and Summary Outlines of Scholarship, 1729–1988. Greensburg: Eadmer Press, 1989. Wikimedia Commons memiliki media mengenai Bayeux Tapestry. Halaman ini terakhir diubah pada 7 Februari 2019, pukul 04.30.